On Sunday, the editors of the Tulsa World published an editorial in which they highlight why they cannot support either Democratic nominee Hillary Clinton or Republican nominee Donald Trump. It is a very detailed argument against both candidates and why the editors feel neither is qualified to be president. Despite their unwillingness to support either of those candidates, the Tulsa World editors could not even summon enough courage to merely name Libertarian candidate Gary Johnson. The closest thing they came to even acknowledging that there are other candidates is to say “Since 1940, the Tulsa World has consistently endorsed the Republican nominee for president, but we’re not willing to do that this time. Neither are we willing to endorse the Democratic candidate or any other candidate.”, emphasis mine. They provide no reasons for not being willing to endorse the only alternative to the duopoly candidates in Oklahoma, nor do they even mention that he is an option for people who don’t want to vote for the duopoly. Why are they unwilling to even name Johnson? My best guess is that the Tulsa World simply lacks the creativity to imagine a world in which one or both of the major duopoly parties would fall out of favor. The Tulsa World editorial staff has invested decades in the duopoly parties and as such they have conditioned themselves to be dependent on those parties to establish a political narrative in their minds and paper. In reality though, their choice to not endorse either duopoly candidate is a tacit endorsement of Gary Johnson, even if they don’t want to specifically say so. By arguing that neither Clinton and Trump is qualified to be president, they are pointing people to look elsewhere. 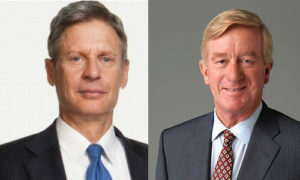 The only place for Oklahomans to look is toward Gary Johnson. In a related note, the NewsOk editorial staff has already written off all 15 Libertarian candidates in Oklahoman. “In November, 15 Libertarian candidates will be on the ballot in legislative and congressional races. None is expected to win”. It is amazing to know that the duopoly parties are still managing to maintain so much control over these two papers. These editorials show that the duopoly parties are running scared. Even if the parties cannot secure endorsements from the papers, they have managed to ensure that the two largest media organizations in Oklahoma do not provide even an air of legitimacy to the Libertarian Party or any other alternative party. This means that the parties are worried about their continued survival. Today, the Tulsa World published my Letter to the Editor. This letter was pretty much word for word my letter to NewsOK, but the World made several edits. Nothing that changed the meaning in any way, just the flow. It is great to see that the World finally picked it up. This letter has sparked a pretty great conversation in the comments that had yet to exist on the Tulsa World website.